Enjoy a game of football at Natterer See Campsite. The children will love the waterslides at Natterer See Campsite. Natterer See Campsite has plenty of areas for you to explore. Want to have a closer look at Natterer See Campsite? If you think Natterer See Campsite in Innsbruck is the holiday park you, why not have a closer look, and check out prices and availability. Natterer See Campsite family holiday park has 235 pitches. Eurocamp have family holidays parks all around Europe. 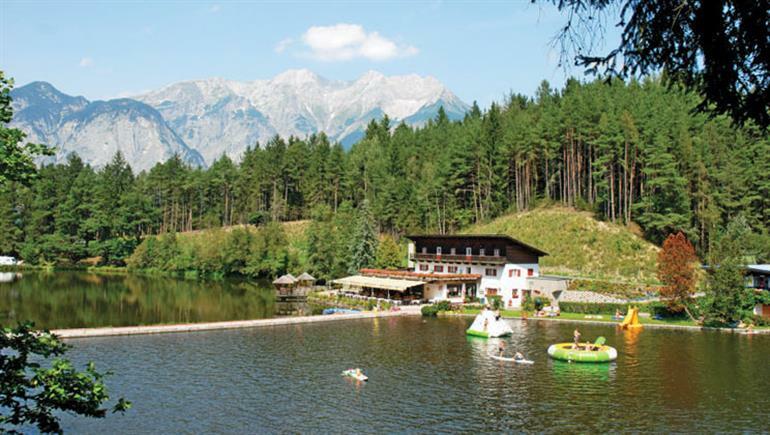 Natterer See Campsite (AU012) is just one of the family holiday parks in Innsbruck, Austria. Have a look for other holiday parks in Austria. You can also see what other people though with the reviews of Natterer See Campsite. These are the reviews for Natterer See Campsite. There are 54 reviews. Excellent campsite in beautiful location. We were very lucky with stunning weather nearly every day. Lots to do in the local area. A well presented camp, our accommodation was clean and properly prepared. The freshwater lake is definitely chilly when you first get in, but you acclimitise quickly. Restaurant service good, everyone is very friendly. Would recommend the camp helps visitors with the wasp problem by providing traps or suitable deterrents. Euro camp courier excellent! Beautiful area with stunning views of the mountains and lake - would have liked the option to select a pitch with a view. close to innsbruck & other areas to visit. we combined with a week at lake garda. Relaxing few days at natterer see before going for 8 day trek in the stubai alps. Beautiful location with trees and fantastic views. - and even an hourly free bus service is available to whisk one down to the town of innsbruck, for sightseeing and exploring further afield. Very overpriced restaurant, wifi signal very poor, site owner has no idea of good customer service. Only saving grace was the free bus travel in to innsbruck. Terry the courier very helpful and apologetic for problems we encountered which were far from his control. We were there for 4 nights. It rained all the time. The holiday was extremely restful. we slept 10 hours a day due to the wonderfully clear air. . weather varied from 8-28 degrees and the last 3 days were very wet. We had not realized that there is little to do in innsbruck so 14 days was a little too long. we had flown to innsbruck and did not want to hire a car. the only restaurant nearby is the one on the campsite which has a limited menu. Excellent parc and very helpful courier but disappointed by paring down of caravan contents eg no coffee brewing facilities any more. Also internal design that squashes kitchen into corner instead of making it the heart of the accommodation. Good location really but reception too car focused. We had trouble getting there as they could not be bothered to spell it out. There is a bus but you will struggle to find it. Again, lots of potential. Shop severely understocked, restaurant keeping very odd hours. Great location though. Needs a sharper team. Eurocamp courier did his best and was committed. All sports activities were off, but that seems normal. No bike hire at all, not even in natters but surely they would make money in such a place?. reception area was modernist treat, really smart, unlike the staff who were pretty clueless and really seemed uninformed about the area. I could talk for hours about austria. Are they bored?. camp was ideal for winnebago's and caravaners, I will say that. The innsbruck area is lovely and one we will return to. Lovely campsite and great location. lots to do in and around innsbruck. Wonderful camp state of the art. Well done. Driving in austria was a challenge but a car was def req at this site even with the free bus to innsbruck which was fab. . amazing scenery - we didn't have great weather though. Holiday-makers are packed in very tighty on this park; this may suit some people but not others. Nattersee was a great site, with the lake and excellent play areas, and close to innsbruck. Unlike other sites, nattersee is well away from any main roads, so was quiet. The restaurant was pretty good and people were friendly. The common facilities we very state of the art, though we had our own in the caravan. We wish we could have stayed longer! would definitely return. Overall, very good but the camp lesiure facilities were not always easy to work out how to access compared say to a centre-parc type holiday. Might have struggled without a smattering of german to read signs etc. Most organization was geared to kid's club which we did not use. Camp gives free buss pass to innsbruck - very useful. Location and lake - spot on, but mobile home bed mattresses need to be better quality! A most enjoyable holiday in a lovely park. The eurocamp mobile homes were stituated in a lovely, safe (for children) and quiet area of the park. The weather was good, the rep was most pleasant and the home was clean, tidy and very well presented. Friendly, relaxing with great scenery . Inclement weather was a negative on the holiday as it prevented some planned mountain hikes. The free bus into innsbruck was good and was well used. We also had 3 guided hikes which was a benefit we had not expected. The site was about 1,5 miles outside natters which meant that the car had to be used. Fabulous time, wish we had booked to stay longer. Nice parc, in a good location, small eurocamp section , only six mobiles, park was very busy with caravans and tents coming and going all the time,tents close to mobile bedroom window. The lake was busy also as it is used by many local residents. Reception at parc very helpful with all staff speaking good english . The setting for natterersee is wonderful. the parc is well designed with excellent facilities. the lake is a splendid feature with easy access, especially at the 'beach' which is sandy. early in the summer season not everything was available (kids club, trampolines and cafe-bar ), and the shop was only open for 5 hours during the day and a lot of maintenance work was on-going. We really enjoyed our holiday at natterer see/innsbruck. We were blessed with very good weather which made it possible to do lots of walking in beautiful surroundings. A free bus service ran from and to the campsite on a regular basis to innsbruck which was a nice surprise for us. also organised walks were available which was much appreciated. The area is wonderful and we are keen to return. We had a fabulous time! we will definitely come again! we heard that this parc was the best available and although we have nothing to compare it with, I can believe it. It had such a lovely atmosphere and we were really able to relax. Can't wait to go again!. . The site was in a fantastic location - the lake was great for our kids (aged 13 and 9) to play in (though probably not so good for younger ones). mountains beautiful and plenty of easy walks. eurocamp mobiles in good location on the site. Great holiday had by all the family. Nice camping - good point for exploring mountains, nice surroundings. Maybe to crowded and not so spacious. 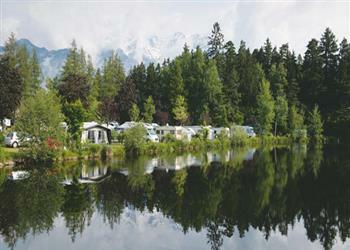 A fabulous camp in a fabulous area of austria - beautiful. Have already started saving to go back :). Wonderful views. Great lake for swimming, children loved water slide. Great bar with lovely service. Restaurant good (although we wished the take away service ran later in the evening). very convenient that there is a free bus to innsbruck which was lovely. Parc was great, lots to do. Accom was great, courier was helpful. Shame it wasn't more affordable, then we could do it every year. Weather was poor. However sun did come out when we visited innsbruck although cool. saw red and tawny squirrels near mobile home. Mobile home fine although prefer toilet and sink and shower together. Using toilet without sink is difficult. Quite a pretty site. Wonderful site, but a long drive, even with 2 stopovers. suggest re-routing across top of switzerland (on the german side) is far more picturesque and quicker than a large semi-circle through bavaria on the motorways! nice walking trails from site and free bus service to innsbruck excellent. site itself busy and very steep for those of limited mobility. Spectacular location,friendly staff and an excellant courier. Remote. Overall a very nice site.the plot we had was reasonably private which was good.there was a plot next to our decking which in busy season would probably have a tourer van and this would have invaded privacy if sitting on decking.francis the courier was helpful and reception was also.we woukld stay again on this site. Another excellent campsite and thoroughly enjoyed ourselves again. This parc had everything and very friendly added bonus was free bus into innsbruck. Lots to do on site and would be great for children. Superb parc. great restaurant. facilities are really good - my boys really enjoyed the 'thunder and lightening' kids shower in the main facilities block.